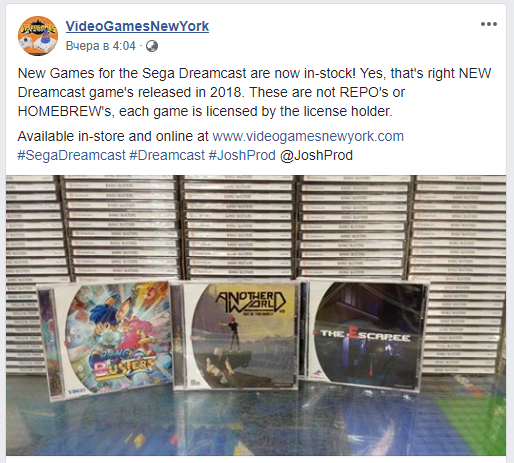 VideoGamesNewYork start selling new Dreamcast games! if you've been waiting NTSC style release, then this moment has come! New Games for the Sega Dreamcast are now in-stock! Also on play-asia you can buy 4x4 Jam and Flashback with discount. Last edited by Ivan GR on Wed Nov 14, 2018 2:54 pm, edited 2 times in total. Ivan GR wrote: VideoGamesNewYork start selling new Dreamcast games! if you've been waiting NTSC style release, then this moment has come! New Games for the Sega Dreamcast are now in-stock! Nice video, i bought the game a few days ago and its nice i can say. I hope JoshProd bring Stardew Valley or Axiom Verge on Dreamcast, while creators don’t have any problem to release their games on DC. People its good to send a message to this guys so we can bring more new games for Dreamcast. This game looks fun. Though it seems to suffer from the same thing that the other Neo Geo emulated games do. It looks like there is some frameskipping going on to keep the game running full speed. Could someone join me trying to play this game online? Seems to be long steps, can we make it easier? Thought id write a little thing to help spread the news of a good cause. New games suppose to be published by JoshProd and Rushongame are shown but not listed yet.